Social Networkers are organizations devoted to creating a large, interactive community. Voice, as arguably the primary tool for human interaction, should have a role in most social networks. But it doesn’t today – owing mainly to the expense and complexity of voice applications. InPhonex Telecom has the powerful, flexible open platform to bring increased interactivity to social networkers. SMS dialers – applications that enable a user to initiate a phone call between two parties simply by sending a text message to our platform. One benefit of SMS dialers is that both parties on the call receive an inbound call which, on most fixed and some mobile phone plans, is free. Web applets – click-to-call, instant messaging, and related applications are a popular way for businesses and consumers to initiate contact. Capitalizing on the impulse to communicate is crucial as many people find that there are so many demands on their attention and time. Smartphone apps – many of the most popular smartphones from Apple, RIM, Motorola, and others allow users to load and run third-party applications. The InPhonex Telecom platform supports apps that run on all the leading third-party-app- capable mobile devices of today and, due to our open, standards-based architecture, all that will come in the future. As a proof-of-concept of the value of our platform to social networkers, the InPhonex Telecom application development team created EverPhone, a Java-based softphone that can be completely customized and inserted into a webpage, an email, or run on a mobile phone or other device. A full-featured, completely customizable Java softphone that can be delivered via HTML: no download, no firewall complications, and no setup. A carrier-grade SIP-based platform with the capability to provide advanced capabilities to thousands of simultaneous users. Reliable, quality termination to any phone, fixed or mobile, anywhere in the world. 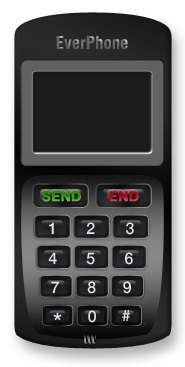 EverPhone can be inserted in an email or put on a web page and can be used immediately just like a real phone. EverPhone can be completely customized: colors, shapes, designs, displays, and buttons can be tailored to meet various needs. EverPhone, as an online application, can be linked to live databases to deliver dynamic content. When someone receives EverPhone in an email or goes to a website that contains EverPhone they can use it immediately. Using its simple, familiar interface. Because EverPhone runs in Java, which is preinstalled on most computers and compatible with all major browsers, there is nothing to download, install, or configure. The first time an EverPhone user clicks on the phone to use it EverPhone checks to see whether the computer being used is phone-ready (speakers and microphone). If not, EverPhone asks the user for the phone they would like to use their EverPhone call credit through. Embed EverPhone in electronic greeting cards. Embed EverPhone in fundraising emails from charities, alumni associations, churches, and other organizations. Embed EverPhone in direct-response emails from merchants like Amazon, Lands’ End, and CDW. Embed EverPhone in periodic customer emails from banks, utilities, and personal service providers. Embed EverPhone in any email that offers a limited-time offer including those from airlines, hotels, any business that sells perishable products and services. Embed EverPhone in any website that has sales, service, and any other form of interaction as its goal. Florists can use EverPhone as an easy way to remind past customers to call and place a new order. Hair salons can use EverPhone to encourage customers to call for an appointment. Car dealerships can send EverPhone to owners whose vehicles are due for service. Electronics retailers can send EverPhone a few days after purchases to sell extended warrantees or for quick access to customer service. Complete a survey, get EverPhone as a thank you. Buy something online, get EverPhone in the confirmation email. EverPhone can be combined with live data, including video, to make a complete presentation: here is our product and here is the phone you need to buy it (or at least ask us a question about it). InPhonex Telecom can route EverPhone calls to a specific number so EverPhone users can enjoy special benefits. If customers use a direct response tool you send them, they deserve a reward. To request a demo account to try EverPhone, please contact us. For more information on EverPhone, click here.